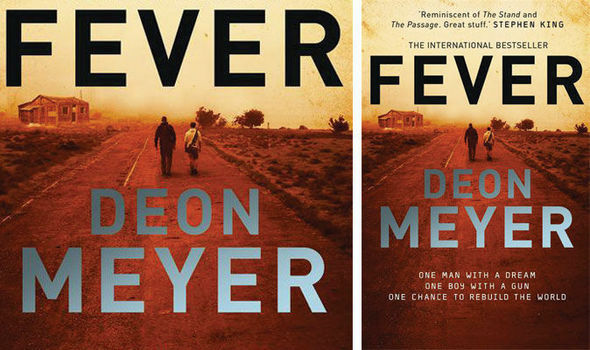 Review of the Week: Fever By Deon Meyer. Fever is a lengthy journey into a post-apocalyptic society, where the goal of building a new utopia is marred by lack of understanding into human nature. In this story, a terrible disease has wiped out the vast majority of humanity, and young Nico travels a depopulated wasteland with his father in the hopes of survival. Unlike most crime novels, where the murder occurs early on and the investigation unfolds over the course of the story, we know that Nico’s father will be murdered toward the book’s end, but we don’t know by whom or why. As the story unfolds, Nico and his father move from struggling to survive to actually thriving, as they make friends—or at least allies—as they gather a small band of survivors and form a commune. The stability of the new town is constantly under threat from within and without, as members of the community threaten to break away, and marauders looking out for themselves are constantly on the verge of swooping in to plunder scarce reserves. It’s an interesting story of survival and a compelling coming-of-age tale. We watch Nico grow up, toughen, mature, and fall in love, though the numerous characters are a mixed bag. Some are intriguing. One character is set up to be the Big Bad, but Meyer wisely decides not to make the situation as simplistic as a more by-the-numbers author would write the plot. Nico’s love interest is well-written, although she follows a well-used (indeed, over-used) template for contemporary heroines. A lot of the minor characters seem flat by comparison, and when one character makes pronouncements about what she doesn’t miss from the pre-plague world, it just seems artificial. Nico’s father is a natural leader, yet he’s not nearly as wise as he thinks he is. A student of Spinoza, Nico’s father believes in a perfectible world, but given what we learn over the course of the book, it’s soon obvious that the man knows very little about human nature… perhaps dangerously little, and it’s this naiveté that may doom several characters. By far the best-written and most interesting character is Domingo, a mysterious figure who understands military tactics and violence, and who makes a point of his disbelief in democracy. Of all the characters, Domingo was the only one who really came across as compelling, and the more I learned about Domingo, the more intrigued I was by him. Fever is a lengthy book, and though some digressions into politics and philosophy dilute the dramatic tension at times, for the most part the suspense slowly builds to a roaring boil, culminating in the tragedy we knew was coming. Meyer’s plot has been sure-footed for most of the narrative, but the final forty pages, with revelations aplenty, fall apart into disappointment. The climax, with the revelation of the villain and the motives for destruction, call out for anger and demands for justice and retribution. Instead, we get a lame little response from a major character, without any of the horror and revulsion that is richly deserved. Indeed, I viewed the villain’s actions as pure, unjustifiable evil, but the novel seems to accept a certain level of sympathy for these atrocities, and as a result, the entire themes of the book evaporate into smoke. By Fever’s end, I lost any hope I might have had for the poor, beleaguered community that had been struggling to survive, for if a prominent figure cannot muster the moral outrage that calls out to Heaven for vengeance, then the remainder of society becomes complicit, and any attempt to build a new world predicated in justice is doomed. Bottom line: the closing pages eviscerate the tone that the previous hundreds of pages built with a rushed, clumsy, and utterly unsatisfying denouement. Fever is a very interesting read, but at times its ambition leads to overreach, and in the end, the reader is left with nothing more than the wreckage of a post-apocalyptic world.